Sponsored post written by me on behalf of Tyson Foods, Inc. All opinions are entirely my own. Let's all stay in for a movie night! Don't you just love a perfect night in? Whether you’re enjoying the night in with just your spouse or the entire family, relaxing movie nights are a must-have every once in a while! I know with our busy schedules, after a long week of school, work and therapy there is nothing I look forward to more than spending some time with my little family. My children love cuddling up on the couch together and relaxing with a great Redbox DVD rental and delicious snacks from Walmart! With Tyson® products ‘Winter to Go’ offer at Walmart you can buy any 2 participating Tyson, State Fair® or Jimmy Dean® products in a single transaction at your local Walmart Supercenters or Walmart Neighborhood Markets. Pick up your families favorite foods like Jimmy dean 12 count Pancakes and Sausage, State Fair 46 count Classic Mini Corn Dogs, Tyson Chicken Fun Nuggets and more! Next, simply snap a picture of your receipt and visit http://www.tysonfreemovienight.com/ to upload your receipt, then it's time to enjoy! 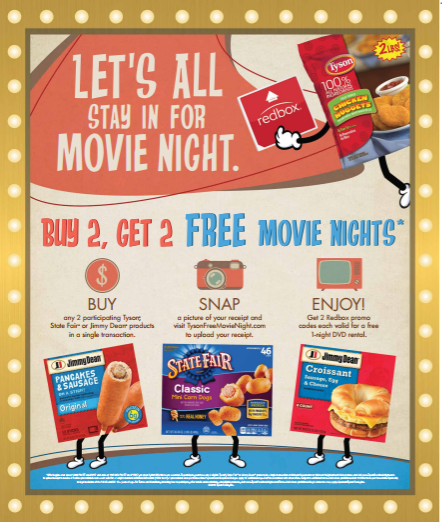 You'll receive two promo codes that are each valid for a free 1-night DVD rental from Redbox*. How awesome is that?! “*” 1 promotional code per transaction. Payment card required. Charges apply for additional days. Can’t be combined with other offers. Subject to additional terms. Void where prohibited. So who's ready for a #TysonFreeMovieNight?